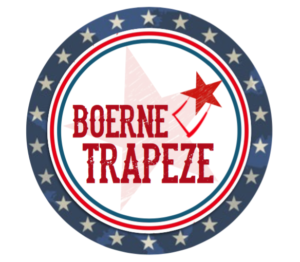 Boerne Trapeze offers fun and unique team building workshops. Our events focus on building trust, opening communication, enhancing confidence of individual team members and increasing overall team cohesion through group participation in rope work, flying trapeze and other circus arts activities. We promise to accomplish all of these goals without subjecting your team to PowerPoint in any way, shape or form! Workshops are led by our Co-Founder, Wayne Labat. In addition to ten years teaching and performing circus arts while also volunteering as a rope rescue technician for the San Diego Sheriff’s Search and Rescue Team, Wayne has a Masters’ in Social Science and is retired Naval Officer with over 20 years of service starting from the enlisted ranks and as a Lieutenant Commander and Surface Warfare Officer. He has led teams of various sizes and complexities, ranging from two person search teams combing the desert at 4am for a lost hiker to running daily operations for an aircraft carrier and its’ five thousand sailors. He is also a father of two beautiful children and a former Ironman triathlete. Wayne mixes all of this knowledge and experience into a safe, exciting and informative workshop that will leave your team with great memories and valuable lessons. Workshops will always be tailored to the makeup of each individual team and goals set in the planning process. The “standard” workshop is a one day long session that will consist of a morning of rope work followed by an afternoon of flying trapeze. The standard workshop starts at $500/person and can accommodate up to 10 people. There will be a lunch break with plenty of nearby local eateries, or lunch can be provided on site for an additional fee and planned when booking the workshop. To learn more about our program or schedule your organization contact us.